A new breed of vehicle is appearing on American roads, and, well, it’s surprisingly straightforward: it’s a minivan that’s an actual mini van. Not the Honda Odyssey or the Toyota Sienna or any of those other bloated family-haulers that may technically be “vans” but are hardly mini, but rather old-fashioned boxes on wheels—low on amenities, high on utility. And as we’ve come to find out, they’re not that bad to drive either. That’s certainly the case with the 2015 Ram Promaster City, which joins the Ford Transit Connect and the Nissan NV200/Chevrolet City Express twins in the Tiny Van Tousle of 2015. Essentially a slightly warmed over Fiat Doblo utility van that’s sold overseas, the Promaster City arrives in Ram dealerships now, both in cargo and five-passenger form, and we recently got our first chance to drive it on a media program in Austin, Texas. Texas is a curious place to launch a “city” van, since practically nowhere in this great Union of ours do trucks and vans have as much room to grow to full size, like goldfish in an Olympic-size carp pool. The congested avenues and narrow alleys of New York City might have been a more obvious place to launch the Promaster City, but the appeal of small utility vans is not just about being the right size for their environment; it’s about possessing the right qualities. And the Promaster City has a lot of right qualities. It starts with being eminently easy to drive. From behind the wheel, the Promaster City’s car-like driving position and surprisingly stylish, ergonomically sound dashboard are more like those of a tall station wagon than a cargo van. Particular helpful if the van is to be piloted by many different drivers is its uncomplicated Uconnect infotainment system with available touchscreen and wifi, which requires little or no learning curve to master, unlike the fussy Sync system in the Transit Connect. Large glass back windows on models so equipped (including all five-passenger versions, which also come with windows in the sliding door) dwarf the tiny airplane-size back windows in the NV200/City Express, blessing the Promaster City with a great view out back when it’s not loaded with stuff. And highly recommended on models with paneled windows is are bumper-saving rear backup camera and parking sensors. The Promaster City’s front seats seem comfortable enough for long-distance drives and are covered in fabric that could handle a plumber’s wrath after Taco Tuesday. The 60/40 split fold-and-tumble rear seats in passenger models, however, are about as cushy as a park bench and have no armrests to speak of (those are highly underappreciated, as it turns out) and hence should be used infrequently and for short trips only. As a compact van weighing about 3,600 lbs., the Promaster City is also is fully competent with just four cylinders underhood, even on Austin’s hilly roads. The 2.4-liter “Tigershark” inline-four’s 178 hp and 174 lb-ft of torque make it the most powerful mill in the segment, while a nine-speed automatic with manual shift control manages the shifting. Thus endowed, the Promaster City is no speed demon at full tilt, but nor should drivers be allowed to blame any late deliveries on their van being too slow. And just as important to the boss is the Promaster City’s impressive 21/29 mpg city/highway fuel economy, which exactly matches the long-wheelbase Transit Connect. The Promaster City is also spectacularly maneuverable, boasting a turning circle that, at just 32 feet, is three feet tighter than a Mini Cooper’s. The steering wheel turns 2.9 times lock-to-lock, which may not seem too remarkable compared to regular cars, but if you’ve piloted a full-size van before, it’s a revelation. Even better, there’s no perceptible on-center dead spot at speed, just crisp, linear response. Ride quality, meanwhile, is downright heroic thanks to a fully independent rear suspension (the NV200/City Express have bumpy rear leaf springs and the Transit Connect has a twist beam rear axle), so if you’re in the business of transporting delicate items like wedding cakes or antiques, this should top your shopping list. However small it drives, the Promaster City can carry a lot. Size wise, it’s very close to the NV200/City Express and the long-wheelbase Transit Connect, yet it manages to squeak more cubic feet into the cargo area: 131.7 cubes on cargo models versus 128.6 for the Ford and 122.7 for the Nissan/Chevy twins. The roof height is a tall 51.8 inches, and as with its competitors, the Promaster City’s rear doors open on double hinges for nearly 180 degrees of total swing, which makes loading wide and bulky items a cinch. The Promaster City cargo model comes with a fully lined floor that is flat and expansive, measuring 87.2 inches from the seatbacks to the rear doors, 60.4 inches between the walls and 48.4 inches between the wheelwells, allowing a forklift to drop in a conventional pallet full of cargo. Up to 1883 pounds of payload can be loaded inside, then secured with its six standard D-rings (four on passenger models). So you don’t have to look it up, that’s 173 pounds more than the Transit Connect and 383 pounds more than the NV200/City Express. Max towing is 2,000 pounds, exactly matching the Ford. Of course, most Promaster City buyers won’t leave their vans just as they came, so Mopar and other upfitters are at the ready to supply partitions, shelving units, and roof racks. The Promaster City also has a huge shelf above the front seats as well as a large open shelf in the passenger-side dash. Prices for the Promaster City cargo model start at $24,125 and $25,125 for the passenger version. The SLT trim adds power mirrors, body-color bumpers, a leather-wrapped steering wheel, touchscreen infotainment, and cruise control to both, for an additional $1,525. For many van customers, having a reasonable amount of well-organized space is more appealing than sheer immensity, and the Promaster City will fit that bill, especially if they plan to put their van in a garage or have limited operating budgets. The fact that it drives so well is icing on the cake. The upheaval in the commercial van market continued in 2014 as the Ram ProMaster hit its stride, Ford introduced the Transit and GM added a small van, courtesy of Nissan. In November, Eurovans (ProMaster, Transit, Sprinter) outsold traditional American vans from Ford, GM and Nissan by 187 units. The gap will only grow going forward as the ProMaster gains ground and the Ford E-Series van, long the major player in the full-size van market, is relegated to chassis-cabs and similar applications. This leaves GM as the only one still making a traditional van and the Chevrolet Express and GMC Savanna are nearly two decades old and don’t offer the space or fuel economy of the newer vans. Thanks to an unusually strong month for the Ram Cargo Van, Ram brand beat Chevrolet brand van sales in November and was just 219 behind the combined total of Chevy and GMC. Ram brand took a 19.1% share of the commercial van market in November, up 12 percentage points from its 7.1% share in November 2013. Year-to-date share for the Ram brand rose 4.5 percentage points, to 8.2% of the market. Both Ford and Chevrolet have lost market share this year. While they account for only about two percent of total U.S. light vehicle sales, growth in the segment has been strong this year. Sales of full-size vans are up 16.2% as of the end of November; sales of compact vans, including the Ram Cargo Van, have grown 25.3%. Both figures are well above the 5.5% year-to-date growth of the light vehicle market. The growth in sales of compact vans bodes well for the rollout of the Ram ProMaster City that’s currently underway. While it’s more expensive than the Nissan NV, Chevy City Express and base Transit Connect, the ProMaster City beats all of them when it comes to capacity, power and configurations. The ProMaster City is derived from the Fiat Doblò, but it isn’t just a clone of the Fiat. Different powertrains and suspension changes are among the modifications made to adapt the small van to the preferences and needs of North American buyers. At a recent event in Texas, Bob Hegbloom, Ram CEO, Joe Benson, head of Ram Commercial, and Mike Cairns, Ram Chief Engineer, presented some of the differences and were on hand to answer questions. First, contrary to what we have seen, the ProMaster City will have the new styling recently unveiled for the Doblò. This improves the appearance, especially from the front. As Allpar has reported previously, the ProMaster City is not a direct competitor to the Nissan NV200, base-model Ford Transit Connect, or the Chevrolet City Express (which is just an NV200 with a higher price tag). It also doesn’t compete with the base Ford Transit Connect. Based on size, capacity, and capability, the ProMaster’s direct competition is the long wheelbase version of the Transit Connect, which retails for almost the same amount as the ProMaster City. The ProMaster City has best-in-class cargo capability with a 1,883-pound maximum payload, a new 9-speed transmission, and best-in-class horsepower and torque. It can tow up to 2,000 pounds. It also has a bi-link coil rear suspension, giving the ProMaster City the only true independent rear in its class. All of these add up to a pretty nice little van. The ProMaster City is sold in both cargo and passenger (wagon) forms; Nissan and Chevy don’t have a passenger configuration, although Nissan does have a special taxi version. The Transit Connect is available in both van and wagon styles, but there’s a big difference: Ford is marketing the wagon as a family passenger vehicle, a mini-minivan that Ford calls a crossover to avoid the minivan stigma. The ProMaster City passenger van is not marketed to minivan customers, but is intended for commercial use as a shuttle or crew vehicle. Early the following morning, it was time to take the ProMaster City out for a spin. Ram had provided both cargo and passenger versions and Allpar got a little red wagon to play with. Starting at the W Hotel in downtown Austin, we went out into the morning commuter traffic and immediately got a lot more experience than we wanted in driving the ProMaster in stop-and-go traffic. The small size and nimble handling were a real benefit when it came to changing lanes and the 2.4-liter Tigershark engine and 9-speed transmission worked well together, providing ample power to adjust to traffic and take advantage of opportunities to get around bottlenecks, something that’s important to van drivers with schedules to keep and deliveries to make – and I speak from experience. Our route took us over city streets, suburban boulevards, county roads and even highways. The ProMaster City was comfortable and easy to drive the entire way. At one point on our route, I was stopped next to a couple of fellow auto writers in another ProMaster City, and the passenger rolled down his window and challenged me to beat them to the next traffic light. Putting the shifter into manual mode, I am happy to say I shut them down. The ProMaster City doesn’t provide the press-your-back-into-the-seat acceleration of a Challenger, or even a properly equipped Dart, but it does get up and go. I can think of a couple of medical labs and at least one blood bank that would appreciate that. The rear suspension is a treat. Unloaded vans have light rear ends and they do tend to hop on poor pavement, but the ProMaster City was surefooted, even on a gravel road. A couple of the vans had 600-pound payloads on pallets in the back, and they were also well controlled and responsive. I took one of those through an obstacle course set up at our destination, the Troublemaker Studios in East Austin. Cab comfort and convenience are important to a driver who might spend hours each day behind the wheel, and the ProMaster City doesn’t disappoint. Entry and exit from the cabin is easy and effortless: no climbing involved. The seat is comfortable and the controls are intelligently laid out. There are also plenty of spaces for paperwork and small items that might be needed during the day. As commercial vehicles, both the ProMaster City van and wagon aren’t long on frills; their target market doesn’t want them and isn’t going to pay for them. But the basics are covered: A/C is standard, the front seats have adjustable backs, the steering wheel is adjustable, and there’s an AM/FM radio. Uconnect (cellphone control) is an option, as is cruise control, though there’s really no reason for standard cruise control on this type of vehicle; the driver would almost never use it. One option that might get some traction is a rearview camera, but the mirrors on the ProMaster City do a pretty good job in aiding backing up the van. The one area that may be an issue is the rear seating in the wagon: Unless the driver is fairly short, rear seat passengers are going to be a bit cramped and the seat back angle isn’t quite as comfortable as it should be. The seat really needs to be about three inches farther back if a driver wants his passengers to think kindly of him at the end of the trip. According to Ram, the seat positioning enables the ProMaster City wagon to offer gobs of luggage, tool or cargo space, but the small amount of additional room a more comfortable rear seat would require wouldn’t have that much impact on the load space. It’s my belief that no Chrysler (FCA US LLC) vehicle should ever be released unless Klaus Busse can sit comfortably in the back seat. At 6’7”, Busse is the ideal template for passenger space. As mentioned earlier, Ram had set up an obstacle course at Troublemaker Studios. There were tight curves, a skid pad and other challenges. The ProMaster City had no trouble with any of these, including a panic stop on the skid pad. Sales of small commercial vans are a niche. Through the end of November, total sales within the segment came to 50,071, with the well-established Ford Transit Connect taking the lion’s share of the action. It remains to be seen whether strong entries like the ProMaster City can grow the market by persuading van buyers to downsize, especially at today’s gas prices. Ram has done its homework. The ProMaster City is a very good base and Ram has been working with aftermarket suppliers to develop commercial interiors with shelves, bins and other vocational necessities for a variety of applications. After all was said and done, our day with the Ram ProMaster City was a day well spent with a dandy little van. Chrysler Group wants to benchmark its 2015 Ram ProMaster City against the popular Ford Transit Connect in every aspect, including price. The Auburn Hills subsidiary of Fiat Chrysler Automobiles NV on Wednesday announced pricing for the all-new cargo van and wagon that directly competes with Ford’s Transit Connect vehicles. The starting prices of the Ram ProMaster City Cargo, primarily for commercial use, is $23,130, plus $995 destination. The 2015 Ram ProMaster City Wagon, for passenger use, starts at $24,130, plus $995 destination. Those compare to the Transit Connect Van and Wagon at $22,130 and $24,655, respectively. Since the ProMaster City’s unveiling in June 2014, officials have touted the vehicle as a proven performer because it is based off of the Fiat Doblo — a two-time International Van of the Year winner with more than 1.3 million units sold. “The new Ram ProMaster City enters the (small van) market with a long list of customer-focused, best-in-class features, including the highest available payload and cargo capacities,” said Bob Hegbloom, Ram Truck president and CEO in a statement. With a 2.4-liter Tigershark and exclusive nine-speed automatic transmission, the ProMaster City delivers EPA fuel economy of up to 21 miles per gallon city, 29 mpg highway and 24 mpg combined. That compares to the Transit Connect that offers two engines, including an optional 1.6-liter EcoBoost with an EPA-estimated 30 mpg highway, 22 mpg city and 25 combined. The ProMaster City is expected to arrive in U.S. dealerships around year’s end. It comes to market as redesigned and new products from General Motors Co., Nissan Motor Co. and Ford Motor Co. compete for sales in the growing segment. Global commercial vehicle sales are expected to grow by 4.8 million during the next several years to 21 million units annually by 2017. The 2015 Ram ProMaster City is the brand’s second shared collaboration with Fiat Professional. The 2014 Ram ProMaster full-size van was the first. With the 2015 ProMaster City, Ram will finally have a small cargo van designed for commercial use — something that’s been missing since the A-vans were dropped. Dodge and Ram have been selling a “cargo-ized” version of the minivans, but it was designed primarily for passengers and never took off among commercial buyers. With power coming from a four-cylinder Chrysler engine, hooked up to a Chrysler-made, ZF nine-speed transmission, Ram claims best-in-class combined gas mileage, a 1,883 pound payload, and 132 cubic feet of cargo volume. The van is based on the new Fiat Doblò XL, an expanded version of the popular-in-Europe Doblò van. Made in a two-seat cargo van or a five-passenger wagon (like the original Caravan), the ProMaster City has 48.4 inches of space between its wheel-wells, which, with an 87-inch cargo length, lets buyers easily load in pallets and such; the class-exclusive extra 0.4 inches help with loading and unloading. Above the wheel wells, the ProMaster City has a best-in-class width of 60.4 inches and an interior roof height of 51.8 inches, for best-in-class volume of 131.7 cubic feet (cargo van). The sides are upfitter-friendly, to help buyers add shelves or storage racks. The roof is prepped for load rails or roof racks, with a weight capacity of 154 pounds. The cargo van’s 87.2 inch long floor has six standard D-ring tie downs (the wagon has four) and an optional flush-fit, non-slip vinyl mat. The sliding doors latch in the open position, and have a 26-inch opening. With the seats in place, the five-passenger ProMaster City Wagon has close to four feet of cargo length to the rear doors; with seats folded and tumbled, the wagon has nearly six feet of cargo length. The rear has 60/40 split swing doors; the larger door swings open toward the traffic (driver) side of the van, making it easy to quickly access larger cargo items without blocking the path to the curb. Both rear doors swing open 90 degrees; with the press of a button, they can open to 180 degrees. ram promaster engineThe ProMaster City is the first commercial van with a nine-speed automatic; the standard “948TE” has a wide gear ratio spread and 3.73:1 final-drive ratio. Its 4.70 first-gear ratio delivers 0-to-30 mph acceleration in 3.7 seconds and 0-to-60 mph in 9.8 seconds (estimated). Even without the wide range and nine gears, the fast-shifting nine-speed’s efficient design would make it a worthy choice. The 2.4-liter Tigershark four-cylinder engine generates best-in-class 178 horsepower at 6,250 rpm, with peak torque (174 lb.-ft. at 3,900 rpm) greater than any standard engine in the segment and close to Ford’s optional turbocharged engine. For durability, the engine has a forged steel crankshaft with 53 mm pin diameters, two-bolt main bearing caps, a cast-iron bearing beam to reduce flexing, piston oil squirters to prevent hot spots, powder-forged steel rods, and the ability to cross 12 inches of standing water (slowly) to prevent damage during sudden downpours. To increase efficiency, the engine has MultiAir 2, an electro-hydraulic valve lift and timing system that adjusts each cylinder individually. Both the ProMaster City and Ram 1500 have variable a/c compressors, “smart alternators,” and pulse-width modulated (PWM) fuel pumps that operate on demand, cutting parasitic demand. The 160-amp “smart alternators” use moments of deceleration or braking to run the alternator at capacity, cutting the load during acceleration and improving fuel mileage. Using front wheel drive cuts weight and the number of parts, provides more predictable emergency and low-traction handling, and eliminates the prop-shaft tunnel to allow a low, flat floor. -Raising the ride height by 10 millimeters (0.4 inches), to manage the greater vertical loads of bad roads. -Upgrading chassis components and anchor points for durability. -Widening the engine box and front track to fit the bigger engine and the nine-speed transmission. -Strengthening body structures to comply with safety rules. -Using tires rated to handle higher weights. The floor pan, cross members, side panels, and (fully boxed) frame rails are welded together for higher structural rigidity, cutting noise and vibration, and allowing better handling; unibody construction reduces weight. The 12-inch front disc brakes include pad wear sensors; a larger pad-to-disc swept area, combined with thicker linings (compared with competitors) increase durability. The rear 10-inch drum brakes also have thicker long-wear linings. The Ram ProMaster City’s MacPherson strut suspension was retuned for rougher North American roads, includes large-diameter shock absorbers, steel springs and a solid stabilizer bar. Stamped steel clamshell control arms are strong and weight efficient. The front suspension components are specifically tuned to handle the ProMaster City’s class-leading payload capacity. An optional package provides a 2,000 pound towing capacity. While most Class 1 vans including the old Ram C/V use rear leaf springs, Ram ProMaster City has an independent, bi-link rear suspension to increase comfort, stability, and safety under all loads, while enabling the van’s low 21.5-inch step-in height. The hydraulic-assist rack-and-pinion steering system is connected to a standard tilt and telescoping steering column. A four-channel electronic stability control (ESC) is standard and includes antilock brakes. The setup uses the steering wheel angle sensor to minimize yaw, and has a brake-lock differential for side to side pressure control and sway control; integrated traction control; rollover prevention; and trailer sway control. On low traction surfaces, there can be a difference in wheel speeds when the driver lifts off the throttle. Engine drag control senses that difference and sends more torque to the driven wheels to keep them at the same relative speed as the rear wheels to boost vehicle stability. Using brake pedal sensing and the steering angle sensor, the ProMaster City also senses emergency braking and automatically lights and flashes the tail lamps to alert other drivers. The van also has brake assist (to engage full braking earlier); and hill-start assist, which holds the van in place for up to two seconds after the brake is released on a hill. Finally, an optional rear camera and backup alarm can prevent drivers from hitting pedestrians or other vehicles. Although the cargo area is carry-over from the Fiat Doblò, from the front door cut forward, the Ram ProMaster City is new. Badges are large, chrome-finished, and three-dimensional. The driver can easily see the front corners, while cladding on the side and rear protect the body from knee-level bumps. Doors are durable yet lightweight, with handles designed for easy gripping with gloves. Optional oversized power side mirrors have adjustable wide-angle sections; the standard, segment-exclusive marker lights light dark areas on the side of the van when working from either side. Step-in heights at the side (18.8 inches) and rear of the vehicle are among the lowest in their class at 21.5 inches. Key fobs have three buttons, for locking all doors, unlocking all doors, or unlocking just the cargo doors. On the Tradesman, the bumpers and grille are black, with molded-in color to look the same even after being scratched. The SLT Wagon has body-colored bumpers, fog lamps, lower black molded-in-color trim at potential contact locations, optional body-color exterior mirrors, and a silver grille. To cover both commercial and personal transport, there are three different 16” wheels. Tradesman has “revolver-hole silver” or black with a silver full-face cover steel wheels; SLT has the latter, with an optional aluminum wheel. Three different window options are available on both trim levels. One has sheet metal everywhere but the front doors and windshield; one adds glass to both rear doors; and the third adds two side windows for passengers. Colors include white, bright red, black metallic, silver metallic, deep red metallic, “blue night” metallic, gray metallic, “broom yellow” (fleets only), and brown (fleets only). The wind tunnel helped optimize the mirror design, underbody aero shields, and spoilers to cut wind resistance, reducing noise and raising efficiency. The tires have low rolling resistance; 215/55R16XL tires have higher inflation pressures to handle larger loads; wheels are steel, for impact resistance, on Tradesman and SLT, with optional aluminum wheels on SLT. Two seating insert materials are used, with different patterns and feels. The seats have ergonomic padding and many adjustments, including heat; the durable fabric is trench -seamed and designed to be easy to clean and long lasting. One interior is black with gray accents; a carpeted floor is standard. There are nine forward storage compartments, including overhead storage. Available in urethane or optional leather-wrap, the standard tilt/telescoping steering wheel’s horizontal spokes can be fitted with optional controls for operating cruise and audio controls. Ram claims to have made major gains in climate control and interior lighting; the elliptical main cluster, placed under an antiglare dome, is designed to reading under all lighting conditions. Amber backlighting prevents the loss of night vision. The gauge cluster includes temperature, speedometer, tachometer, and fuel gauges, with a trip computer including a clock, odometer, and trip odometer. The shifter is in the center console; a secondary console contains two cupholders and two 12V power outlets. The Ram ProMaster City HVAC system was retuned for the North Americans, with easily operated heat and air conditioning controls that were designed for use with gloves. The oversized handle on the driver-side door panel also enables easy opening with gloves; a large storage compartment at the forward base of the door. The cargo compartment has acoustic-backed side wall and rear door moldings, and vertical mount locations for flexible up-fit capability. Optional partitions (with a window option) provide protection against load shifts. A high roof makes it easier to work in the cargo area. Wagons get four tie-down rings, a full length headliner and carpet, panel moldings over the rear of the cargo area, and more storage trays at seated shoulder level with retractable covers. The base radio is a four-speaker AM/FM setup with a monochrome display; tweeters are in the pillars and mid-range speakers are in the front doors). The optional UConnect 5.0 system has a handsfree text-reply setup and hands-free calling, with a full-color five inch touch-screen aiding the navigation system and steering-wheel-mounted audio controls. A USB port on the dash is for recharging, while a second port is used to play music from thumb drives. U.S. buyers can use the system as a mobile Internet hotspot. Mopar claims to be selling towing accessories, roof racks and carriers, customizable graphics packages, theft tracking, a roadside safety kit, tool bags and totes, canvas seat-covers, cargo mats, standard floor mats, and slush mats. The 2015 Ram ProMaster City will be built by TOFAS in Bursa, Turkey, at a 3.6-million squar foot (84 acre) WCM Gold plant, alongside the Fiat Doblò. How far off were we? Before the ProMaster City’s official launch, we said that it would be imported from Turkey, with an American powerplant — this was correct. We implied there was a chance it might be built elsewhere, because the Turkish joint venture company said they could not make it with modifications for the US — we were wrong. We predicted fold and flip seats, and thought that the British “XL” model would be sold here either as the standard model (it is) or as an option. Our rendering was pretty far from the mark, though some may find it more pleasing. The dashboard seen in our spy shots (well, KGP’s spy shots) turned out to be different in appearance, though not in content, from what we got here. 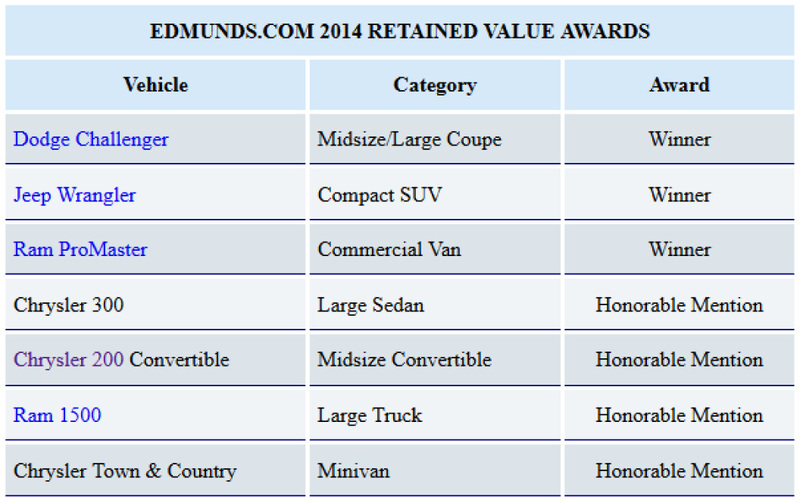 The Dodge Challenger, Jeep Wrangler and Ram ProMaster van were among the vehicles with the “Best Retained Value,” according to Edmunds.com. The awards recognize brands and models that have the highest projected residual value after five years. The Chrysler 300, Chrysler 200 Convertible, Ram 1500 and Chrysler Town & Country all received honorable mentions in their categories. Vincentric has named the Ram ProMaster Diesel 1500 standard roof van with the 118-inch wheelbase its “Best Fleet Value” in the Full-Size 1/2-Ton Cargo Van category. Vincentric, LLC, which celebrates its tenth anniversary in 2014, provides insight to the automotive industry. Based in Bingham Farm, Michigan, the company uses a proprietary cost-of-ownership database to measure and analyze the overall cost of owning and operating vehicles and its impact on the value provided to buyers. In addition to the ProMaster, the Dodge Grand Caravan was named Best Fleet Value in the Minivan category for the third year in a row; the Dodge Journey pulled off its own three-peat in the Mid-Size Crossover as did the Jeep Patriot 2WD in the Entry-Level Crossover segment. Late last month, the Jeep Wrangler won Vincentric’s “Best Value in America” award in the Compact SUV category for the third consecutive year and Ram 3500 brought home its second consecutive “Best Value in America” award in the one-ton pickup competition. Are ProMaster diesel’s coming soon? Buyers who have been holding out for a diesel engine in the Ram ProMaster van may be satisfied soon, as the company has told dealers that the engine, boasting 295 lb-ft of torque, 174 horsepower, and “phenomenal fuel efficiency,” is on the way. The van market has long been in the doldrums, with buyers having a choice between ancient, fuel-hungry Fords and expensive Mercedes, but is now becoming hotly contested with new entries from Nissan (including one badged as a Chevrolet), Ford, and Ram. The Ram ProMaster has two powertrains, one already on sale — the Pentastar V6 coupled to a six-speed Chrysler automatic — and the other, a Fiat design, reportedly available for ordering this month. The latter is a four-cylinder diesel, created by Fiat Powertrain (FPT), confusing displacing the same 3.0 liters as the VM diesel in the Ram 1500 and Jeep Grand Cherokee. Ram boasted that the Fiat engine has exceptional low-end torque and cold-start capability, with a forged steel crankshaft and connecting rods; 5%-biodiesel compatibility; best-in-class 18,500 mile oil change intervals; an efficient M40 six-speed automated manual transmission (which can be treated as though it’s a full automatic); and a standard towing/hauling package. The package may be attractive not only to normal fleet buyers, but to the upfitters who have started making ProMaster passenger vans and campers. As Sergio Marchionne flies back and forth between Turin and Auburn Hills, he doesn’t just bring Chryslers back with him to Italy to sell as Lancias. He also brings Fiat products to sell Stateside under various Chrysler labels, chief among them Ram. The former Dodge truck brand launched the Fiat Ducato as the Ram ProMaster earlier this year, giving it Ram ProMaster City badgea greater foothold in the commercial vehicle market and a replacement for the Sprinter which Mercedes-Benz took back from its Chrysler-partnership days. Now Auburn Hills has announced that Ram will begin selling the Fiat Doblo on this side of the Atlantic as the Ram ProMaster City. The Doblo, which was twice named International Van of the Year, has sold over 1.3 million units worldwide. Whether that includes the rebadged version which Vauxhall and Opel sell as the Combo is another matter, as is the question over how much longer Fiat and General Motors will continue that particular partnership as the ties between Fiat and Chrysler deepen. The ProMaster City jumps into a newly hot competitive set with smaller commercial products like the Ford Transit Connect, Nissan NV200 and the Chevy City Express.